In conjunction with Deepavali celebration, the Management of KPJ Ipoh Specialist Hospital distributed traditional Deepavali goodies to all patients in the hospital. Planned as an annual event to strengthen unity among races in the country, in a 1 Malaysia spirit, all non-nursing staff were dressed in their cultural costumes. Staff of the hospital also participated in decorating the lobby area with Kolam, the colours of Ranggoli, a form of folk floor art from India, to create the festive ambiance. Traditional Indian music was also played at the lobby area throughout the day. KPJ Ipoh Specialist Hospital has taken the initiative to save Mother Nature by going green. It recently launched its “Go Green” at the lobby area of KPJ Ipoh by the Chief Executive Officer of KPJ Ipoh, Tn. Hj. Asmadi Mohd. Bakri together with Director of KPJ Ipoh, Dr Luis Chen Shian Liang. 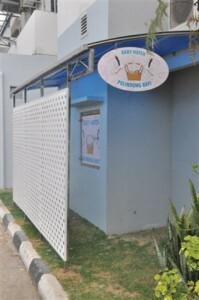 Special efforts are being made to educate their staff and customers on being eco-friendly, helping them to understand what are the good deeds each can perform by creating awareness through training, best recycle corner competition, no styrofoam usage at cafeteria and no-plastic day on Saturday. After the launch, the staff of KPJ Ipoh performed a gotong-royong, cleaning up the hospital compound and pledging to sustain the utmost cleanliness for a healthy and hygienic environment. KPJ Ipoh Specialist Hospital recently launched its Extracorporeal Shock Wave Lithotripsy (ESWL) services and its new Home Nursing Services’ vehicle. The launch was officiated by President/Managing Director of KPJ Healthcare Berhad, Tn. Hj. Amiruddin Abdul Satar together with Advisor of KPJ Healthcare Berhad, Datin Paduka Siti Sa’diah Sheikh Bakir. 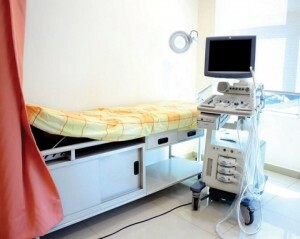 The ESWL machine offers the latest kidney stone treatment technology in Perak. Investing more than RM1.4 million, this machine will be used by two Consultant Urologists. ESWL is a non-invasive procedure which utilises shock waves instead of a scalpel or endoscopes to treat stones in the kidney and urinary tract. It breaks kidney stones into small fragments without damaging the organ or surrounding tissue. Patients can then expel the fragments more easily through the urinary tract. ESWL is extremely safe with advantages such as no scarring, minimum anaesthesia, short recovery period, and the whole procedure only takes 45 minutes to an hour. The replacement of KPJ Ipoh’s Home Nursing Services’ vehicle with a new Avanza model is mainly to cater to the increasing number of clients. The hospital provides a range of mobile nursing services such as: post natal care; baby care; medical and surgical care, like changing of gastro-feeding tubes, wound care, bed bath, skin care, suction and others. Physiotherapy is the latest service offered this year. KPJ Ipoh is looking ahead for more upgraded facilities and advanced services for patients’ and visitors’ highest satisfaction. Home Nursing Services are services rendered to all clients who require support and continuity of care at home. These services are to facilitate self-care and optimal independence on factors affecting the individual’s health status. It is also to support patients and family members in providing care comfortably and in the privacy of home. With the intention to enhance speedy recovery with continuity of nursing care at home, KPJ ISH is providing the services at an affordable price. For more information, contact the Home Nursing Team at 05-241 8989. For the third time, KPJ Ipoh Specialist Hospital was invited by Pangkor Island Beach Resort to give CPR and First Aid Training for their staff recently. The objective of this project was to educate the front liners, from various departments of Pangkor Island Beach Resort, on the importance of CPR training in saving lives. 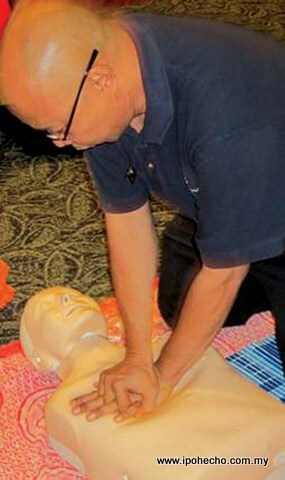 A total of 18 staff attended the training conducted by four CPR and First-Aid trainers. Among the topics covered were ‘Basic Life Support and CPR’, ‘CPR Techniques Demonstration and Practice for Adult and Child’, ‘Adult and Child Choking’, ‘Infant CPR and Infant Choking’ and a first-aid workshop. The training focussed on: drowning, choking, snake bite and heart attack, which are more common in the industry. At the end of the training, to ensure that it was well comprehended, all participants were given a practical evaluation and written test. The introduction of a baby hatch by KPJ Ipoh Specialist Hospital has helped reduce incidences of baby dumping in the city. The hatch, introduced in December 2010, has received six babies so far. Their parents could not be traced as they were left in the hatch without any identification. Two have been sent to the state welfare department while the remaining four are still undergoing treatment at the hospital due to health complications. Deputy Minister for Women, Family and Community Development, Senator Dato’ Heng Seai Kie visited the hospital recently to see the hatch for herself. Speaking to reporters after a tour of the facility, she thanked KPJ Ipoh Specialist Hospital for undertaking the responsibility as part of its corporate social responsibility. There are only two places in the whole country that offer such service. The other is Pertubuhan dan Pengurusan Anak-anak Yatim Kuala Lumpur (OrphanCARE).” The KL care centre, which was opened in April 2009, has saved 59 babies since its inception. “It’s our fervent hope that government hospitals would follow suit and provide such a service. Baby dumping is a growing menace and unless remedial steps are taken, the future may not be too rosy,” she lamented. Her ministry is currently in discussion with the Health Ministry for a possible solution. A workshop to deliberate over the matter will be held in October. The Women, Family and Community Development Ministry maintains 55 welfare centres throughout the country. These centres provide shelter for abandoned children. There are 56 Nur Sejahtera clinics around the country which provide similar services. Unwed mothers and those with kids out of wedlock can seek counsel from these clinics. The Nur Sejathera hotline number is 15999. Dato’ Heng was accompanied by the Perak Welfare Department Director, Dato’ Chong Phaik Kee and Dato’ Dr Cheah Abdullah, Director of KPJ Ipoh Specialist Hospital. 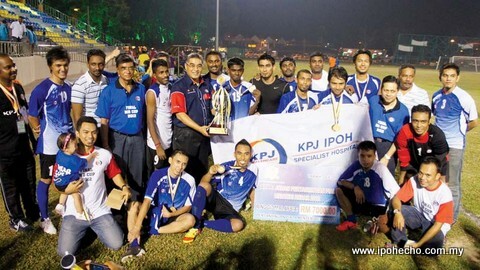 KPJ Ipoh Specialist Hospital won the Menteri Besar Cup of 2012 over Persatuan Bola Sepak Manjung, 2-1. The final match, held at Stadium Astaka, Sitiawan, Perak, saw hundreds of supporters from the Hospital at the venue despite the distance. With the formation of 4-4-2, defender, Thanabalan had the first strike followed by midfielder, Saviri. The mastermind, Saviri was voted best player of the match. KPJ Ipoh Specialist Hospital achieved a record for being an undefeated team – winning every game throughout this championship. Dr Kalidasan Govindan maintains ‘waterworks’ of the biological kind. He is the new/old kid on the block who has just set up in private practice as Resident Consultant Urologist at KPJ Ipoh Specialist Hospital. An old boy of the Anglo Chinese School here, Dr Kalidasan received his MBBS from Manipal, India in 1995, MS (Surgery) National University of Malaysia in 2003, Board of Urology Malaysia certification (exit exams) in 2007 and spent a year and a half obtaining a Fellowship in Urology (Australia) in 2008. Coming here from Johor Bahru where he was Consultant Urologist Head of Department in Hospital Sultanah Aminah, Dr Kalidasan expressed delight at being back in his hometown and being close to his aged parents for whom he can now play an active role in their well being. He is also excited about being able to introduce some new diagnostic technology to assist patients in getting the best treatment for their urological problems. “I have always been under the possibly mistaken impression that Urology deals primarily with men, prostate and their waterworks and all that, so do you also see women?” I asked in all innocence when I sat down with this young (41 year-old) doctor with the charming smile. “So you also treat urinary incontinence in women?” I asked. “Both in men and women,” he replied. “Although most people who suffer from urgency incontinence blame it on aging, which is only one of the causative factors, urgency incontinence has an 80% success rate with medication and a few dietary changes such as cutting down on gassy drinks, caffeine, smoking and alcohol. Stress incontinence (loss of urine) which is induced by coughing or laughing can be treated with pelvic floor exercises or sling surgery. Sling surgery (TOT) has more than 90% success rate. So instead of suffering embarrassment or in silence, people with incontinence should go to a urologist”. Another common problem afflicting more men than women is that of kidney stones. Dr Kalidasan was very optimistic about the new machine which is scheduled to arrive in KPJ ISH, the state of the art Extracorporeal Shock Wave Lithotripsy (ESWL) machine, a non-invasive tool that breaks up kidney stones painlessly. 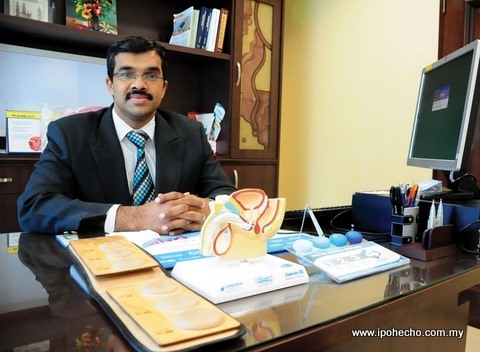 One of Dr Kalidasan’s specialties is in the field of endourology, a minimally invasive surgical technique that avoids cutting open the organ in question using only scopes which require only small puncture wounds in the abdomen or back. These techniques are varied, using different tools and scopes for different problems with the advantage of minimal downtime for the patient. In fact some of these procedures do not even require hospitalisation. So what is your final word of advice to people on taking care of their ‘water works’? “This is my message to people out there. At the first sign of something amiss, not quite right, pain on urinating, accompanying lower back pain or increased frequency of urination and especially at the first sign of blood with or without pain, run, don’t walk, to the Urologist. The earlier caught the sooner cured”. KPJ Ipoh Specialist Hospital’s baby hatch received its fifth baby on February 8 at 9.45 p.m. 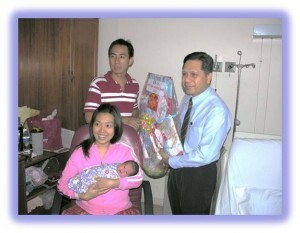 The baby weighing 3.37kg is a healthy 2-day old baby boy. He is currently being looked after by the hospital’s paediatrician in the paediatric ward. 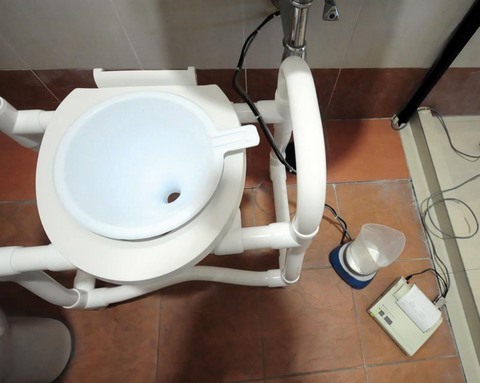 A baby hatch is a place where mothers who are unable, or unwilling, to take care of their babies, can leave them in a safe environment where they can be cared for in collaboration with the Social Welfare Department of Perak (SWD). Many of these babies die in places such as toilets and dustbins. They are innocent and they have the right to live. The Baby Hatch is equipped with various facilities and supported by the management of KPJ Ipoh Specialist Hospital with the support of its medical consultants. 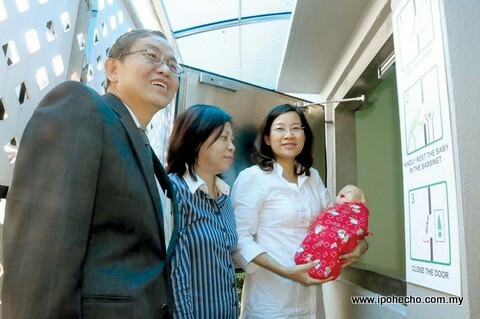 KPJ Ipoh Specialist Hospital is the first hospital within the KPJ Healthcare group to set up a baby hatch. This year’s Chinese New Year of 2012 was extra special and most meaningful for two new mothers with the addition of their new-borns! Two babies were born on January 23. Madam Chin Siew Wai gave birth to her first baby girl at 12.48 a.m., weighing 2.73kg; meanwhile Madam Tan Kia Im gave birth to her first baby boy, weighing 3.15kg at 11.23 a.m. To celebrate this blissful occasion, the Management of KPJ ISH presented Chinese New Year Dragon baby hampers to both mothers (pic shows CEO of KPJ Ipoh Specialist Hospital, En. Mohd. Nasir Bin Mohamed presenting the hamper to Madam Tan and husband). To these first time mothers, welcome to the mama’s club! And you Dragon babies, go conquer the world!